When Aleksis Kivi’s (1834–1872) Finnish tragedy Karkurit (‘The Escapees’) was originally published in 1867 it was considered better than his two former plays, the Kalevalaic tragedy Kullervo (1864) and the comedy Nummisuutarit (‘Heath Cobblers’, 1864). Soon these encouraging views, however, turned completely opposite. Dismissing attitudes towards Kivi’s play were dominant until the 1960s when new theatre productions made its artistic merits worthy of consideration again. The critical edition of Karkurit gives a new and more versatile image of Aleksis Kivi as a playwright and helps to understand his tragedy in the light of the changing artistic ideals of different periods and generations. The edition contains a scholarly edited and richly annotated text of the tragedy’s first edition. Expert introductions by leading authorities illuminate the multidimensional dramaturgy of the play and reflect its relation to the European drama traditions and the socio-historical context of 19th-century Finland. 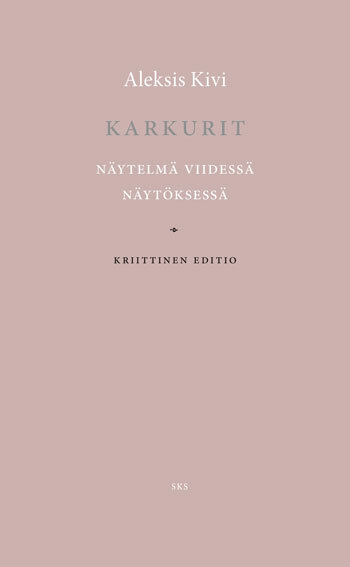 In addition, the introductory articles analyse Kivi’s pioneering blank verse dialogues and discuss how Karkurit was published and performed from the 19th century up to the present day. The appendices include, among others, versatile text-critical apparatuses, an overview of the first Swedish dramatization of the tragedy (1872) and an earlier version of the play, an excerpt that was originally published in a magazine one year prior to the first edition of the drama. Edith editions are based on scholarly analysis of manuscripts, first editions and other historical sources. They reflect and clarify Finnish literary culture for scholars, teachers and other readers interested in literature.